The Actionable Intelligence for Social Policy Network is composed of sites with integrated data systems of various sizes and levels of development: from those with newer infrastructures to more established sites. Network members are expected to be active in all Network activities. These include responding to requests to share expertise and consultation, when possible, with other sites and potential new sites. There are also two Network meetings each year in addition to other opportunities that may be of interest to your site and partners, including, but not limited to, special projects to promote integrated data systems, opportunities to create training materials, and meetings related to multi-site research. Establish ongoing data sharing and integration from at least three agencies or program providers (e.g., Child Welfare, School District, etc.) that include formal documentation of the relationships (e.g., signed Memoranda of Understanding (MOU). Lasting infrastructure that exists beyond a single project. This should include analysts or analytic capabilities through partnerships that can support multi-site research projects. A formal structure (governance) to review and approve specific projects that utilize the integrated data system at your site. 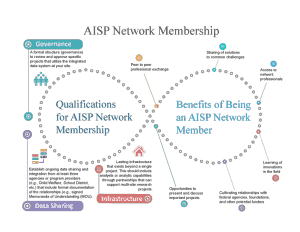 If you are interested in joining the AISP Network, please contact TC Burnett at burnettt@upenn.edu.